While the developed world holds many amazing features and opportunities, sometimes individuals can get overwhelmed with the sheer amount of choices and information we have. In the past, stores would offer a few varieties of clothing and jeans – if you wanted anything else, you’d have to make it yourself. In today’s world, countless styles, cuts, colors, and fabrics are available just for denim, and with contrasting recommendations from fashion experts, it can be difficult to identify just what style, cut, and fit work for you. Here are a few helpful hints to aid you in your hunt for the perfect fit. Watch Trends It’s important to pay attention to how styles are changing and adapt accordingly. What was cool when you were in college may be this year’s mom jean. Current hot styles are baggy jeans, skinny jeans, slim-cut jeans, and wide-leg jeans. The trick with these styles is to make sure you match the correct jean with the correct body type. Contrary to what you might think, baggy jeans often look better on slender people, and skinny or slim jeans often look better on heavier people. 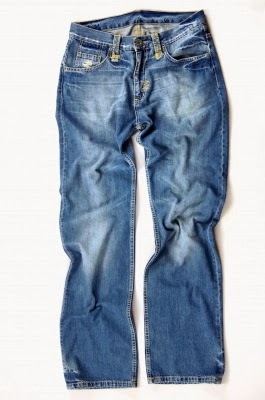 Baggy jeans add bulk, and skinny jeans look slim. Keep these principles in mind as you shop for your body type. Know Your Colors If you’re having trouble knowing what shade of denim to buy, darker is usually the best option. Dark jeans can be easily dressed up for a casual date where you want to look your best without overdoing it, or for casual Fridays at work. They also are slimming and classic. Lighter jeans are fine too, but know what you’re looking for. The lightest shades of jeans can look odd unless you’re striving to make a fashion statement, and many jean manufacturers create wear in the denim to give it depth, but some can appear weird. When in doubt, go dark. For some color options, check out this wide variety of Levis. Check the Length Length is a very important factor when selecting jeans. Those with long legs often have a hard time finding the right length of jean, and it’s really important to keep hunting until you find it. A jean that is too short evokes an awkward image. Jeans that are too long are easily tailored. About the Author: Kate Beckam is a fashion writer and blogger. She prefers skinny jeans and loves that she can find Levis for women as well on the site. I have 2 pairs of Levis and neither of them fit right. That is interesting. Ever since I had kids, I've been out of the trends loop. Last time I checked, low rise was everywhere. I'm hoping it's gotten better. If I came into money, I would be buying myself nice jeans!